WorkLogic HR is a powerful business offering comprehensive human resources services for companies large and small. They’re known for their quality HR packages, including services from HR consulting and outsourcing to payroll, benefits, and worker’s comp. As the company continues to grow, CEO Jeffrey Thorn recognized the need to recruit top talent and new generations to optimize the organization’s future. In order to recruit and retain talented employees, Thorn knew the 21,000 sq ft Bakersfield office would need to be designed to reflect a welcoming and thriving company culture. “[Millennials] are really about the atmosphere and the culture of what they work for,” said Thorn. StrongProject approached the space with the mission to prioritize ergonomics, comfort, and productivity while accommodating the need to break away from daily workstations with private spaces for concentration. The center open office area was installed with cutting-edge rounded ergonomic seats, acoustic furniture for more private one-on-ones, and multi-use tables for relaxing or brainstorming. 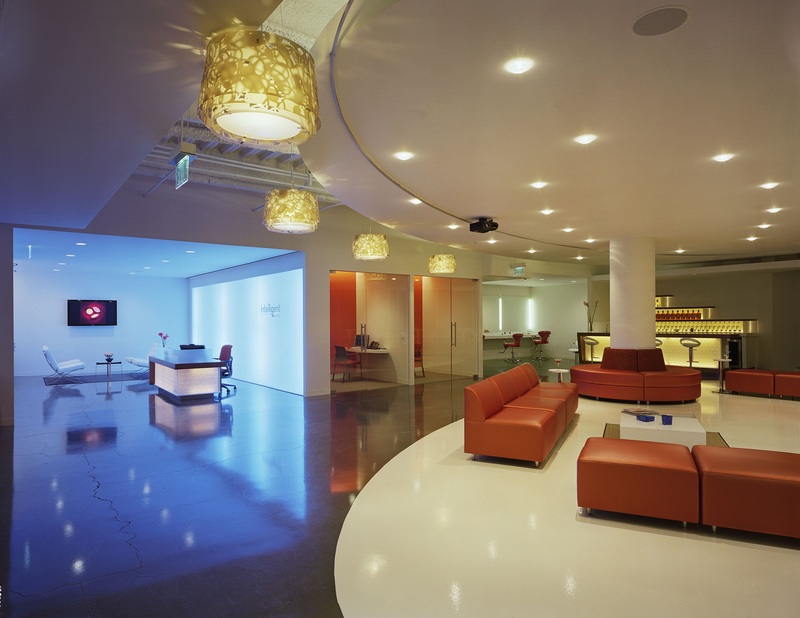 This open office area, centered in the commercial work space, could regularly bring employees together and build rapport and connection. Instead of trying to create one or two huge conference rooms, StrongProject and WorkLogic agreed that multiple smaller collaborative spaces would be more beneficial to promote agility in thinking and steps toward progress on group projects. 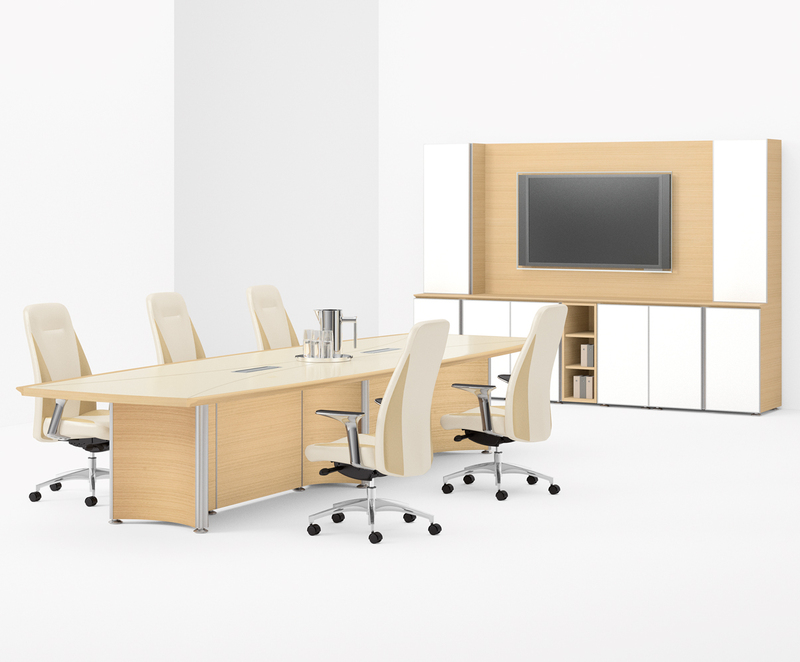 The SP team designed varied collaborative furniture layouts that preserved a streamlined brand. One brainstorming collaborative area was equipped with rounded green office chairs, attached mini-tables, and a portable charging tower, while another collaborative space was outfitted with a four-top work table and seating. 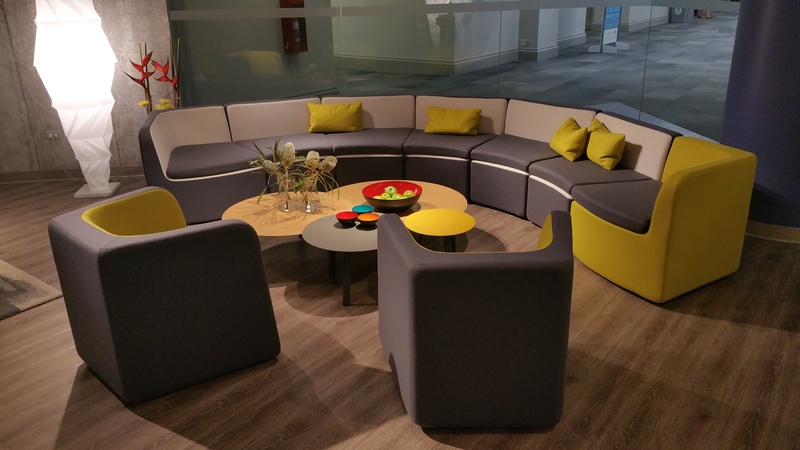 StrongProject also encouraged multiple use open-office spaces by installing long couches to allow people to break away from workstations and enjoy adjustable side tables. 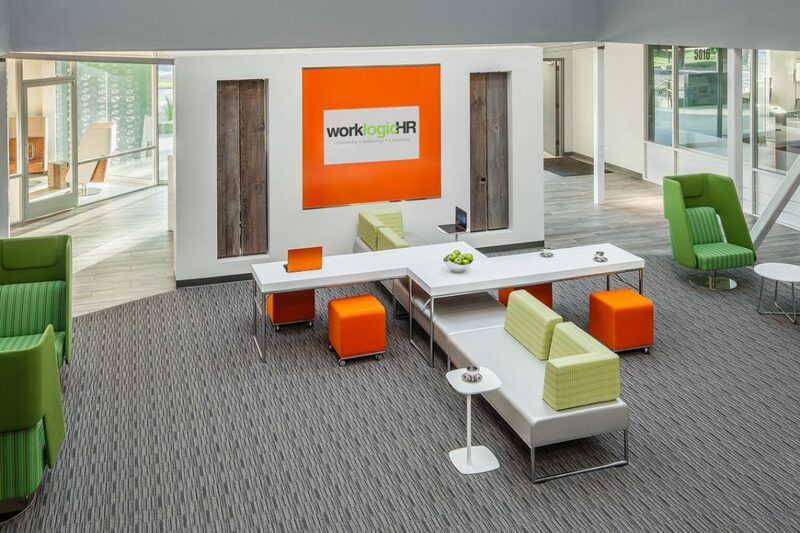 Private offices included adjustable height desks and modern, low white filing systems to maintain a clean look against the bold green and orange brand colors.